A recent report from the census bureau puts the number of Americans in poverty at a record 49.5 million when expenses are taken into account, or over 16 percent of the population, the size of a large country. A similar number lack basic health care. When concepts like “financially fragile” or “living paycheck to paycheck” are used (meaning little or no savings and income just covering expenses), numbers of over 50 percent are common. The amount of unemployed equals the population of Illinois, the nation’s fifth largest state, meaning there are more unemployed people in the U.S. than there are citizens in all but Florida, New York, Texas and California. The percentage of people actively in the workforce is down to what it was in 1981, before two-income families became the norm. Life expectancy is actually decreasing for the poorest members of society. Doubling up”, or multiple generations living under the same roof (dubbed “reduced household formation” by economists ) has been on the rise, and homeownership is down for the first time in decades. The age of cars on the road is an all-time high. Food banks are regularly overwhelmed with demand. From three to six workers exist for every new job opening, and job fairs regularly attract thousands from all over for just a handful of available jobs. Drive through “flyover country” and you’ll see that all is not well in the heartland, from rural towns dominated by boarded-up storefronts, meth labs and food banks, to inner-cities dominated by crack houses, gun violence, panhandling and homelessness, to older suburbs dominated by foreclosures and dollar stores. Everything just worked out okay? But all of this is ignored in the mainstream media, who instead continue to insist that jobs are plentiful and all is well in the post-Fordist deindustrialized economy. In fact, since the factories were shut down in the 1970-1990’s, there have been any number of “[fill-in-the-blank] economies” peddled by professional economists (“knowledge” economy, “information” economy, “service” economy, “FIRE” economy, “sharing” economy, “gig” economy, etc.). They insist that making things is so twentieth-century, and that the demand for “service workers” and “knowledge workers” is bottomless. The one constant between these ever-shifting adjectives is they have all been abject failures in the real world at providing lasting prosperity for anyone outside of a tiny circle of wealthy elites. One reason we’ve been able to ignore reality for so long is because the worst of the fallout from automation was dumped on the African-American community, whom we then scapegoated and ignored, as I’ve documented in the last couple of posts. That community has totally collapsed, and the success of a few winners and the easing of institutionalized discrimination was used to justify the horrible abuse, injustice, and deprivation doled out to the majority who were castigated as “lazy” and “moral failures.” But the effects of automation have affected not just African-Americans. They have decimated a vast swath of society, and it’s been largely ignored and covered up by government and the media. This does not bode well for the future. 6) “Surely, the most astonishing statistic to be gleaned from the trend data is the deterioration in the market outcomes for men with less than a high school education. The median earnings of all men in this category have declined by 66 percent [not a misprint] [from 1969 to 2009]. At the same time, this group has experienced a 23 percentage point decline in the probability of having any labor-market earnings. Roughly 10 percentage points of the 23 percentage points is attributable to the fact that more men are reporting disabilities, even though work in physically demanding jobs has been declining for many decades. Men with just a high school diploma did only marginally better. Their wages declined by 47 percent and their participation in the labor force fell by 18 percentage points.” (page 13). 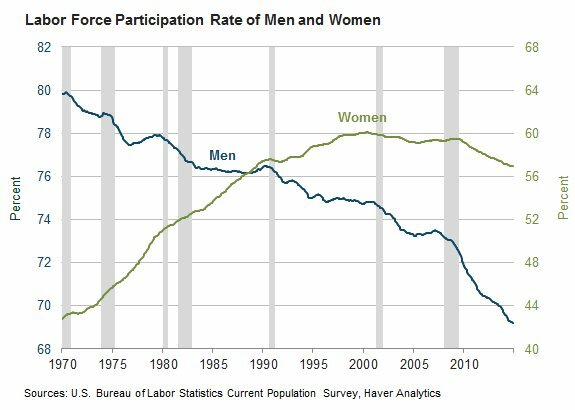 1) The total labor force participation rate, which considers all of this, has declined in the last 15 years from about 67%, where it was throughout the 1990’s, to about 64% (from the Current Population Survey). The machines eventually got horses. They shifted the demand curve inward so much that the supply had to decrease by over 99% to keep the market wage for those horses that remained above the subsistence level. And you could have made the same argument for horses that you hear all the time for humans – It never happens. Hundreds of years technology has advanced, and we’ve always found jobs for as big, or bigger, a population of horses. Automation and efficiency has largely already eliminated the need for workers with a high-school education or less from any role whatsoever in the economic order. We take this for granted, but it was not always so. I’m sure we’ve all heard the stories of our penniless peasant immigrant ancestors migrating here with hardly any education at all and working their way up the ladder sweeping streets and selling newspapers, and such like. Before the 1930’s it was a reality. Not any more. We’ve already lost a great deal of labor. High-school educated workers have already gone the way of the horse. That’s not a future scenario, it is right now. Clearly, there have been serious and profound affects on the job market since President Johnson was warned of this phenomenon back in the 1960’s, yet we’ve largely written them off! All we hear from the economists is how we created plenty of new jobs in the age of automation. After all, the “official” unemployment rate recorded by government statistics is only five percent. Five percent!!! Men lost 2 times more jobs than women from the Great Recession and have gained half as many jobs since late 2007. Since 2004 median income has fallen by 13% while expenditures have risen by 14% according to latest figures pulled by Pew Research. One in three Americans can no longer afford rent, transportation, and buy food. Ten states still have not regained all the jobs they lost in the recession, even after six and a half years of recovery, while many more have seen only modest gains. Graduates in the UK are earning less than those who did not go to university. The proportion of American workers who don’t have “traditional” jobs — who instead work as independent contractors, through temporary services or on-call — rose 9.4 million from 2005 to 2015. That was greater than the rise in overall employment, meaning there was a small net decline in the number of workers with conventional job. Half of all job switchers earned less in their new roles. In February of 2016, the media widely celebrated the official jobs report which claimed that 242,000 new jobs created. Here’s what they didn’t tell you: Of the 242,000 jobs added, 304,000 of them were part time. That means the economy actually shed 62,000 full-time jobs. Job polarization – middle-skill occupations are disappearing, while low- and high-skill occupations are growing. The startup deficit – a dramatic decline in the creation of new firms. The (mechanized, computer driven) cart docks at a conveyer, and robots with amazing dexterity and speed bag up your groceries and call up your computer-driven car. Then, your mechanized cart (which you didn’t have to push or steer. It stayed with you.) goes to your car, and robots load the bags in. The shelves are stocked by robots, and most janitorial and other functions are done by them too. And if you read The Second Machine Age, Rise of the Robots, or just out, The Master Algorithm, you’ll see that robots aren’t that far from a lot of this even now. And solar, at least in the sunbelt (reporting from Tucson), powers all these machines relatively inexpensively. The roof of the supermarket is covered with solar panels, and the parking lot is shaded completely with solar paneled canopies – This kind of thing is not that rare even today in Tucson, and Moore’s law in solar is only accelerating after more than a generation. The sun food for the machines is, and especially will be, a whole lot cheaper than the farmed food for the humans. So, is more education the answer? The problem is, as with high-school workers above, the education requirements for having a job–any job–keep rising. And it’s doubtful than even if every one of us could get those requirements, there would be enough jobs to go around. In a society where everyone is an Einstein, Einstein sweeps the floor and empties the trashbin. …if you say: Oh, ok, it’s just horses and men who don’t make the effort to become skilled and educated enough, so no problem, they just get skilled and educated enough, and then the robots and AI’s are no risk. Then, what if skilled and educated enough so all this is no problem goes from high school diploma to bachelor’s at a nationally known respected research university, and with the commensurate skills? Or even the commensurate skills of just the top half of such graduates today, so we can’t just grade hyper-inflate our way out of this, and throw up a bunch of Potemkin colleges. To do so would take a regime shift in our politics, and in public understanding of economics. By and large, one of our two major parties not only does not believe in global warming, or evolution for that matter, they don’t believe in externalities, asymmetric information, natural monopoly, contracting limitations and costs, and basically anything that says the pure free market is imperfect (except in cases where it benefits the rich). But providing a massive increase in the education, skills, and general capabilities for most of the population is something that free market companies could only extract a small fraction of the benefits from in profits. And therefore they alone would grossly underprovide this. Indeed, as David J. Blacker has documented, companies are already divesting themselves as much as possible from funding for all education. Instead, companies dump all the costs for training onto the back of the individual, because they can. In fact, some people are literally selling stock in themselves just to afford the cost of education, in a twenty-first century version of indentured servitude. Those who get the remaining jobs will mostly be those who are best able to afford it, meaning a class-stratified society based on inherited wealth. All risk is transferred off of the corporations and onto the backs of the workers themselves. Also, Neoliberalism, the prevailing economic philosophy today, believes that everything must be provided by the competitive market, and if the market does not provide it, it simply will not exist–something that does not bode well for access to education. Instead of dealing with this, in true American fashion, we’ve just let the “free market” take care of it, and what the free market has done is primarily create a string of chains of for-profit colleges preying on desperate workers who want to earn more than subsistence wages. The externalities, contracting and enforcement problems and costs, adverse selection and other asymmetric information, and so on, are profound and enormous. This is why general education has historically been predominantly publicly funded. To say that now, so that most of the population won’t go the way of horses, we have to enormously increase our investment in Heckman-style early human development, education, public nutrition, healthcare, and more, from prenatal until at least well into a person’s 20’s, is to say that we should have an unprecedented increase in governments’ size and roles. Did we see such a massive investment in the African-American community after their jobs went away? Did we see the “Heckman-style” early childhood intervention which Serlin describes? [National Review’s Kevin Williamson] a long-time critic of The Donald, essentially agrees that he doesn’t support any policies or rhetoric directly tailored to the working-class — particularly about jobs being taken by outsourcing and immigration— because it would be wrong to do so. That’s right, labor unions and “progressivism” are the root cause of Detroit’s failure, not automation or the loss of good-paying jobs, according to this line of thinking. And an angry “get a job” bellowed at the unemployed is the only answer worth contemplating, even as jobs disappear and pay less and less. Joblessness is all a result of individual failure and moral malaise–all people need to do is hit the books and climb in in the U-Haul; that is, make themselves amenable to the new economy using nothing but their own resources. And if they have little to no resources, well, then they need to grab a firm hold of their bootstraps. And to top it off, these are the same people who are diametrically opposed to raising the minimum wage. He’s using the exact same phrases and sentiments that have been used against African-Americans the past forty years. Expect to see a lot more of this thinking coming from the Right’s propaganda outlets as automation accelerates. Of course, to win elections they have to favor Social Security and Medicare for seniors. But, from my study of politics, I think that most of those who control the party would like, if they could get away with it without losing political capital, to end Social Security and Medicare. And, in fact, they fought Social Security and Medicare tooth and nail when they were first enacted. And I also think that many of those in control of the Republican party would like, if they could get away with it at no cost in political capital, to eliminate most, if not all, publicly financed education, infrastructure, and research… Just read their platform, and the positions of their major candidates; it’s pretty obvious that the direction they’d like to go in is the opposite one. Ayn-Rand inflected free market fundamentalism is the dominant philosophy of the executive class who control the nation’s wealth, and, via campaign contributions, its government. Does that sound like a society that’s going to make the investments in education necessary based on the above, or one that will continue to portray a society of “makers and takers” as the jobs are automated away? Recall that the last candidate for president on the Republican ticket claimed to his wealthy backers (secretly) that forty-seven percent of Americans, because they pay no Federal income taxes, take no responsibility for their lives, and are just looking for handouts. And his vice-presidential candidate was fond of saying that America’s threadbare social safety net had become, “a hammock lulling people into lives of indolence,” and whose biggest political influence is Ayn Rand. Both called for a drastic shrinking of the safety net and massive tax cuts for the richest Americans, tax cuts that will probably ultimately help fund the technology that automates away even more jobs. So Kevin Williamson’s thinking above is not fringe at all. So, if it’s going to require a massive increase in human development, education, skills, and general capability for most men not to go the way of the horse, then that edification is not going to happen anytime soon. And things could get very bad. And for a large segment of the population, the statistics show it already has…. So, I don’t think we can take that much solace in the reply, all the low-skilled men have to do is become high-skilled to avoid going the way of the horse. If everyone went to university, there wouldn’t be enough places for them. The best universities are predominantly located in urban areas with high rents, and besides, they already reject many of the people who apply to them for a variety of reasons. Furthermore, our expensive and inefficient education system is designed to take at least four years to complete because of unnecessary padding and frills (despite our insistence that it be a glorified vocational school). What are these people supposed to do in the meantime? And even if we expanded online options, we would just have more underemployed people, or a more educated unemployed workforce. Online college won’t create new jobs (except, or course, for those providing the education). The economy isn’t primarily creating fast-food jobs because of a lack of education, instead, educated people are being forced to take on these jobs. Just being more educated does not automatically produce a job for that educated person. Education does not, in and of itself, produce more jobs. Only a growing economy does that, and we have had anemic growth since the 2008 financial crisis. The destruction of African-American economic fortunes due to automation and the fallout from that were the major driving forces in American politics in the latter-half of the twentieth century, as we saw last time, yet this factor is almost totally ignored. Suburban sprawl, white flight, abandoned cities, ghettos, housing projects and automobile dependency can all be laid, directly or indirectly, at the feet of automation. Yes, automobile dependency–anything “public” is now associated with black people by rural and suburban whites, including public transportation, so they fight tooth and nail to prevent its expansion. Here in Wisconsin, Republicans blocked the (fully funded) train system from Milwaukee to Madison from being built by playing on white suburban fears of blacks streaming out of Milwaukee’s inner-city to steal TVs during the daytime. In Milwaukee, a streetcar line and expansion of the bus system are also being opposed by the same suburban whites. New Berlin residents divided on racism’s role in city’s housing decision (JSOnline) I don’t call these places “white separatist enclaves” for nothing. They are the modern-day sundown towns. We also saw that this was the primary driver of the rise of the far-right Republican party, and the near total conversion of the white working class to a strain of politics that defines itself primarily by hatred of “big government,” taxes, and welfare. This hatred of “big government” sprang up after civil rights, and opposition to welfare after the epidemic of joblessness in the inner-cities. Taxes became seen as primarily funding black indolence rather than education, infrastructure, defense, and so forth. Notice that there have been no major domestic legislation initiatives since the civil rights era (Obamacare being an exception, but that inefficient system passed largely as a giveaway to big insurers). Why do white working-class voters vote against their own interests? It’s no mystery, really. We then saw that factors like the 1994 signing of NAFTA and the 2001 entry of China into the WTO, along with automation, decimated the white working class as thoroughly as the black one, once again with a small fraction of lucky and/or talented “winners” able to escape the deluge. And the same divide-and-conquer tactics are being played out yet again, this time along class, rather than predominantly racial, lines. And we’re now seeing those factors drive the next stage of our politics–candidates who promise to ‘Make America Great Again,” bring the jobs back, and rein in the excesses of the rich and Wall Street. Automation is not some science-fiction scenario. We have been living with its effects for the past five decades. And it’s now accelerating. Despite the obfuscation by professional economists and the media, those earlier warnings about the fallout from automation were not, in any sense, “wrong”–they were prophetic. We need to stop bickering and start dealing with this new reality, before Detroit becomes less of a warning sign, and more the reality of Americans’ day-to-day lives from coast to coast, regardless of the color of their skin. Sadly, I see few signs of us coming to grips with this new reality any more than we did in the past. This entry was posted in Automation, Politics by ch. Bookmark the permalink. There’s one fly in the ointment here and it’s that robots are expensive. A robot simply can’t work as cheaply as a human being. A computer, somewhat expensively, can mine data, comb for keywords, etc., but to actually move in the physical world is extremely energy expensive. This is why the planet’s dominant life forms are not robotic. There’s been plenty of time for Mother Nature to evolve robots, trust me She’s come up with weirder things, but it hasn’t happened because organic life forms run circles around machines in the real world. I look at the whole AI/robotics thing the way I look at the nuclear industry – it’s a great futuristic idea but I’m not convinced the nuclear industry has ever actually produced more energy than it’s consumed. When I was in college I was a real nuclear fanboy because it’s new and cool and all that, and I’d order all kinds of obscure books on it, and even the official gov’t publications, which I believe you can still order cheaply, reveal that nuclear is hard as hell to do and expensive. Here’s a clearer example: The rocket scientist I work for loves to tell people how he’s actually worked out the energy needs etc of the replicator on Star Trek, and has concluded that it would take the energy of a small atom bomb to make that hamburger or chocolate shake. You’re dead wrong. What is the cost to raise a baby to a working adult, compared to the cost to make a machine to perform work? And once the first machine is made to perform the job, making future machines is the cost of raw materials and assembly.